WHOLESALE ONLY Grower to Nurseries, Garden Centers & Landscape Trade. 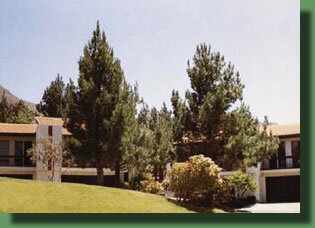 Supplying Arizona, California, Nevada, New Mexico, Oklahoma, Texas and Utah. 35, 25, 15 and 7 gallon container sizes. 2 year old 7 gallon size fields. 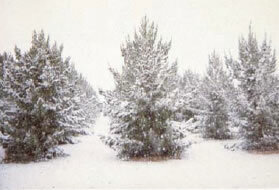 Early winter snow on our pine farm. Pictures of our many sizes and more! 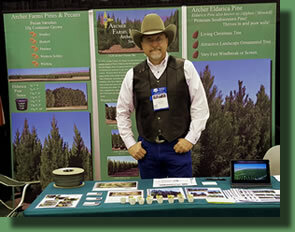 Archer Farms, Inc. Eldarica Pine and Pecan Farm is located 25 miles north of El Paso, Texas and 15 miles south of Las Cruces, New Mexico. 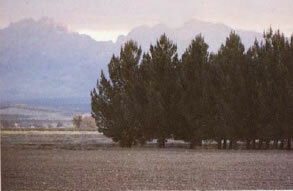 Archer Farms is one of the Southwest’s leading producers of Pinus Eldarica (Afghan Pine, Desert Pine etc.) 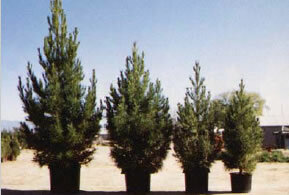 and leads the industry in overall production of quality pines. In 1978, Archer Farms began its cultivation of an Iranian strain of Pinus eldarica and through the years has developed, from its parent seed stock, its own strain of Eldarica far superior to any now available on the market. We have bred out of our New Mexico strain, many of the unfavorable characteristics common in most other Eldaricas, including those of the Afghan and Azeri varieties. Our New Mexico strain, Archer’s Eldarica, is more dense and more compact than most, giving it a full Christmas tree shape. 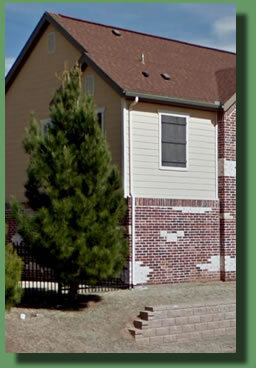 Our goal today, as well as in the future, is to furnish our customers with the finest quality Eldarica Pine available. Over the years, we have developed a reputation of quality by strictly controlling every facet of our production. We raise our own selected strain of seed to ensure a top quality seedling, thus starting our four year growing cycle. After the second year, our 7 gallon size will be harvested, followed by the 15 and 25 gallon trees the third year and our 35 and 45 gallon trees terminating the four year production period. 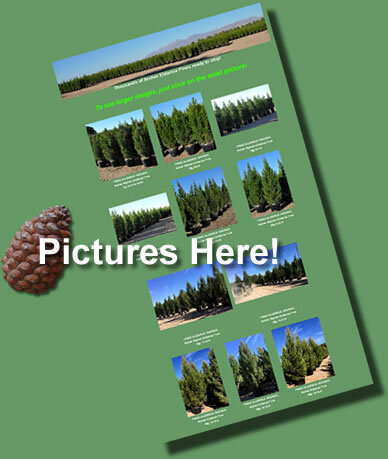 All our pines are field grown and harvested in November through February being placed in their appropriate container sizes to maximize their holding time. This allows Archer Farms the ability to supply customers with Eldarica Pines throughout the year as supplies last. 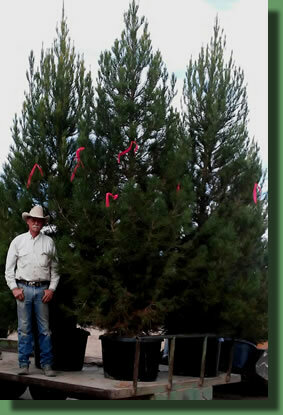 This particular species has become the Southwest’s most versatile Pine, being used as a live Christmas tree and a very popular landscaping evergreen in commercial and residential landscapes. 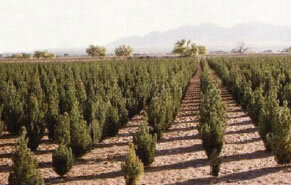 Eldarica Pine, commonly known as Afghan Pine, have successfully been planted as visual barriers and windbreaks, not only effectively controlling our strong Southwest winds, but also preventing top soil erosion. Because of its native origin in the desert regions of the Middle East, the Eldarica is well suited for our Southwestern climate and soil types. It prefers well drained alkaline soils, with maximum growth occurring during summer months when temperatures reach 90 to 100 degrees F. During this time it is not uncommon for established Pines to put on 3 to 4 feet of growth in one growing season. The Eldarica is also very adaptable to a wide range of elevations, growing successfully from slightly above sea level to over 6500 feet. Its one drawback, however, is its inability to withstand severe cold and should not be planted in areas that sustain sub-zero temperatures for extended periods of time. If used as a live Christmas tree, care of the Eldarica is very simple. 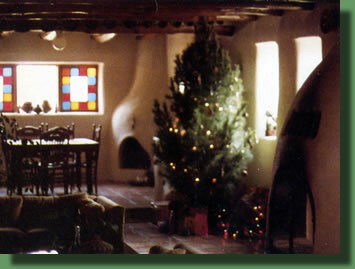 First, the trees should not be kept indoors for more than two weeks and should be kept away from any heat sources. If purchased earlier, leave the tree outside and water regularly so the root ball remains moist. Give the pine a good soaking prior to moving indoors and water it by placing several handfuls of ice cubes on the top of the root ball everyday or at least every two days. This not only cools the root ball, but trickle irrigates it as well. Just remember that there is less water in ice than you may think, so give the tree plenty. When moving the tree from inside your home to its planting location, please acclimate it gradually to the winter environment by placing it first on a porch or inside a garage for a few days so it can adjust to the cold and dry weather. Keep it wet! Plant it in a sunny, well-drained spot in a hole slightly larger than the bucket it sits in. Water it on a regular basis, two or three times a week. Do not fertilize the tree for at least one year, as it will not require it. If you wish to put an additive in the planting hole, Milorganite is our recommendation. It is organic and will not burn the roots. 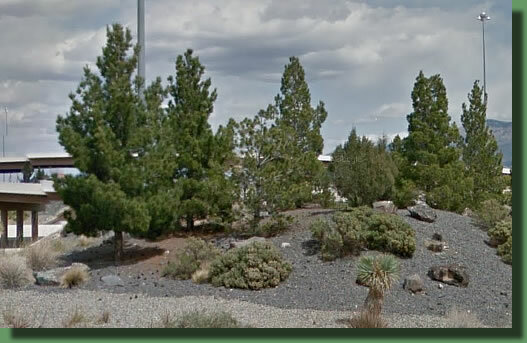 It is a desert species, known to be a great xeric (low water requirement) tree, but the Eldarica does require regular watering for the first several years. Once it starts growing well (3 to 4 feet a year) begin weaning it away from its normal irrigating cycle. Cut the water down by a third or even half. This causes the tree to start developing its multiple tap root system, thereby anchoring the tree properly. This develops a strong and healthy root system. If this very fast growing pine is shallow watered as it gets larger, there is a chance that one of our very high winds will blow it out of the ground, due to the fact it was never allowed to develop its tap roots or lateral anchor roots. Depending on where the tree is planted, once established, it may never need irrigating again. It is known to survive on only eight inches of precipitation a year. Archer Farms has a minimum order of $1,500.00. However, we will do our best to accommodate smaller orders if we will be in your immediate area when you need the trees. We ship on vans and flatbeds through various trucking companies at the best rates we are able to arrange. We can ship full loads and partial loads as we are able to fill trucks. Of course, you are welcome and encouraged to pick up your order at the farm. We request at least a 24 hour notice for us to have adequate time to pull and prepare your order. Orders can be picked up from 7:00 AM to 2:00 PM MST, Monday - Friday. If you would like to pick up on a Saturday, arrangements can be made by Appointment ONLY, for pick up before 12:00 Noon. © Copyright Archer Farms, Inc.